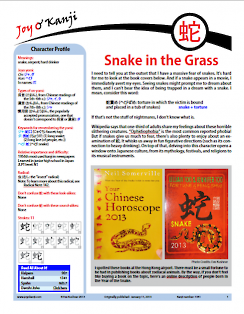 I'm the biggest snake-phobe around, and even so I can tell you that there’s plenty to enjoy about an examination of 蛇. It whisks us away in fun figurative directions, as with its connection to heavy drinking. On top of that, delving into this character opens a window onto Japanese culture, from its mythology, festivals, and religions to its musical instruments and children's songs. p. 1: Changed the radical name from むし to むしへん. p. 17: Reworked the text on this page quite a bit and fixed two dead links. Jan. 11, 2013: Originally published.